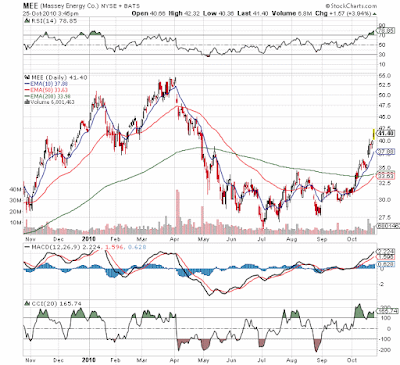 A couple of analysts have come with targets in the $60+ range for Massey Energy (MEE) based on a report that the company is up for sale. Recall that MEE suffered the mine explosion at Upper Big Branch (UBB) that killed 29 miners. Naturally MEE has suffered under tighter regulatory scrutiny and a management team that has been focused on the tragedy. Results have suffered, but back in May we suggested that investors focus on the assets particularly the met coal reserves [Buy the Other Disaster Stock]. The WSJ broke news last Wednesday that MEE was seeking a sale. Today we've seen estimates from a couple of analysts that MEE would be worth north of $60 in a buyout. That number seems high, but the stock has been highly depressed due to the accident hence the signal to buy the stock over the summer in the first place. MEE just didn't face the long term issues of a continuous leak so it seemed absurd for the stock should suffer so much. Stock dropped from a high near $55 on April 1st to nearly $25 by July 1st. 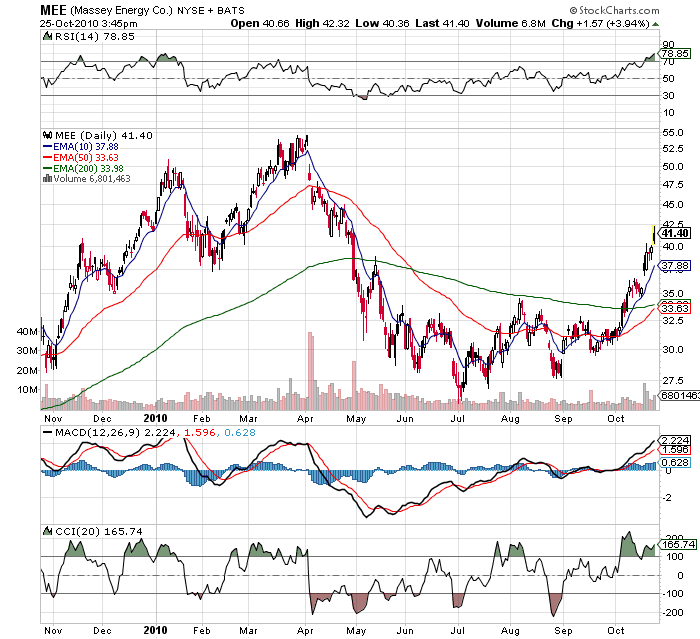 With MEE only trading in the mid $30s prior to the WSJ news, $60+ seems highly unlikely regardless of the asset quality. Wall Street tends to not pay much more then 30-40% premiums for stocks especially ones with regulatory risk. Gladly accept a deal in the $60s allowing us to exit a coal position and reduce our exposure to the sector. Stone Fox owns Alpha Natural Resources (ANR) and Puda Coal (PUDA) in both the Growth and Opportunistic portfolios in addition to MEE so we'll remain highly exposed to met coal and Asian demand growth if cashed out. Not really expecting a deal and it was never a theme of the original purchase. 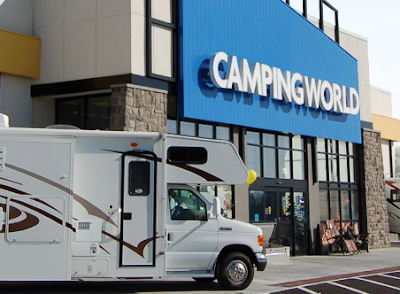 The stock will continue recovering with or without a buyout. Andrew Ross, of First New York Securities, said the loss of production from the Upper Big Branch mine and the resources the company is devoting to investigating it and responding to federal regulators have depressed Massey's stock. He said based on the estimated value of Massey's coal reserves, the stock currently trades at a 25 percent discount compared to its peers. He speculated that if Massey goes to market and multiple bidders emerge, "a price above $60 per share could be realized." The coal producer's officers and directors own just less than 1 percent of the company's 103 million shares outstanding. Shares of coal producer Massey Energy (MEE) are up $1.99, or 5%, at $41.82 after Stifel Nicolaus & Co. analyst Paul Massoud this morning wrote in a note to clients “Would Cliffs buy Massey? Should they? Could They?” referring to coal producer Cliffs Natural Resources (CLF). Massoud is following up on The Wall Street Journal’s article by Kris Maher and Joann Lublin, who wrote on Wednesday that Massey is exploring a possible sale of the company, citing anonymous sources. Massoud notes Massey this year bought Cumberland Resources, while Cliffs purchased INR Energy. In the case of the INR deal, Cliffs paid $6.36 per ton. That’s well above the $2.50 per ton of coal that Massey might command for its $2.8 billion tons in reserve. That $2.50 per ton implies a $62 per share bid for Massey, muses Massoud, a $6.32 billion buyout. With $1.5 billion in capital available to Cliffs, the company would need to go to private equity for the rest of the financing, he notes.